How to Iron a Shirt....the professional way. Finally had time to sew...a new shirt for Roger! DIY Sewing Machine Repair ! I always strive to have my garments look as good on the inside as they do on the "public" side. One of the techniques I use to do this, I showed to you in a tutorial long ago before getting a new camera...so when I sewed the trial garment of Vogue 8800 (shown below), I took the opportunity to stitch and show you this Wrapped-Edge Facing technique again...this time in more detail and with better photography. When sewing a basic convertible collar shirt like the one above, we usually finish the loose edge of the facings (the long curved edges not sewn to the shirt fronts) by serging, zig-zagging, or by turning the raw-edge 1/4-inch to the wrong side and stitching. That's perfectly fine, but there is another way to finish those long front facings so that they look like this and give the inside of your garment some pizazz! The two facing pieces needed for the shirt fronts are cut from the fabric following the pattern exactly. 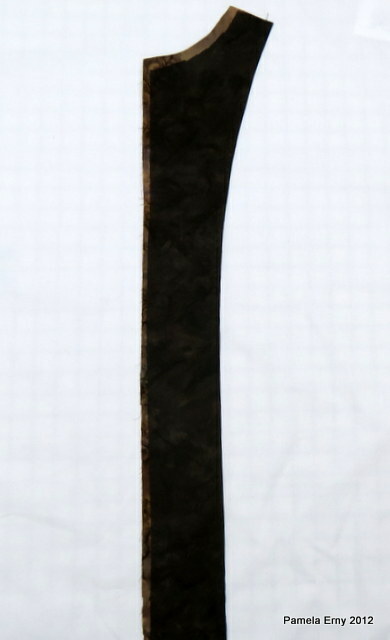 In order to wrap the edges of the facings, it is necessary to use a soft and very flexible interfacing like ProSheer Elegance from www.FashionSewingSupply.com . 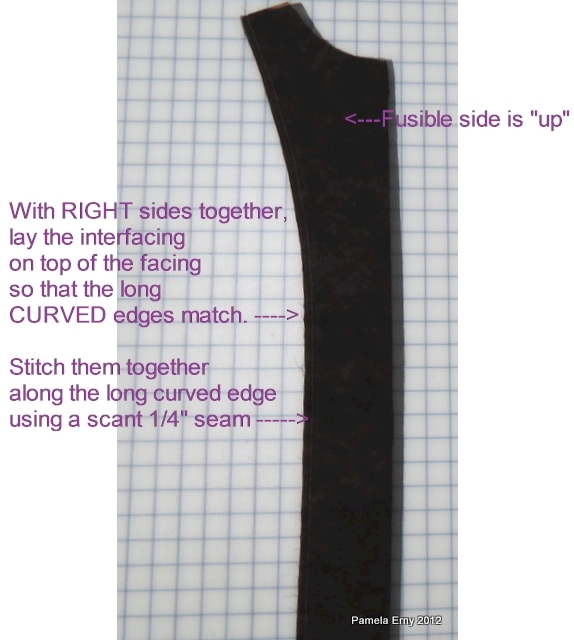 As shown below...Place and pin the facing pattern piece on the straight grain of folded interfacing, and then draw a line 1/2" away from the long curved edge. 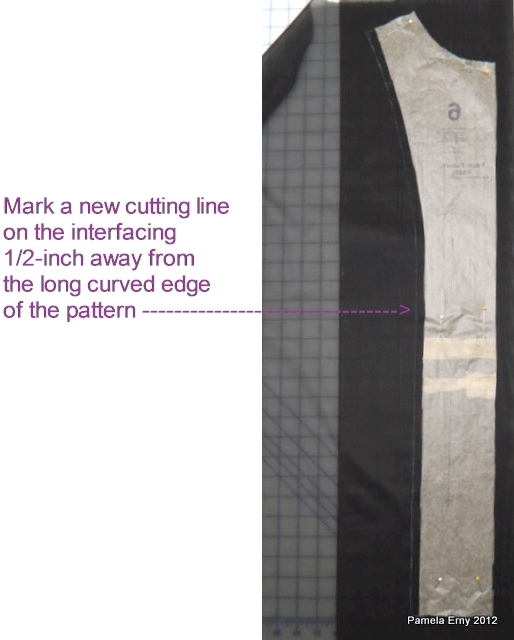 Cut the interfacing following the pattern piece along the straight long side, neck curve and top...but use the new drawn line when the long curved edge is cut. Yes, the two pieces of interfacing are now wider than the two facing pieces that were cut from the fabric. The interfacing is then placed on top of the facing RIGHT SIDES TOGETHER, so that the long curved edges match. The fusible side of the interfacing is facing "up". Then the 2 layers (1 interfacing + 1 fabric facing ) are stitched together along the LONG CURVED EDGE with a scant 1/4-inch seam. 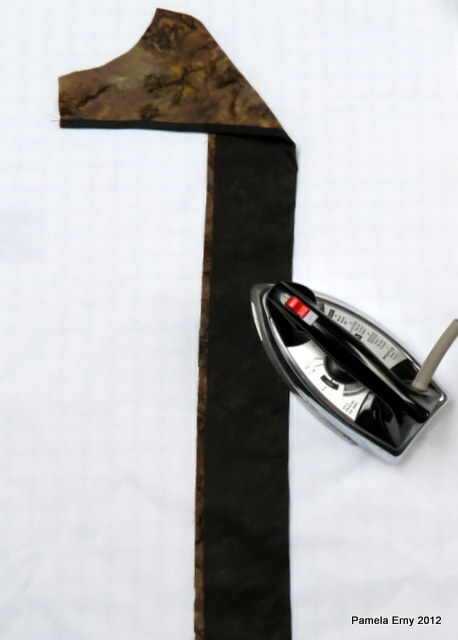 Next as shown below-- On your pressing surface...the interfacing is folded "open" from the facing it is stitched to, and VERY CAREFULLY....it is Pressed ONLY along the the seam allowances with the tip of the iron. BOTH seam allowances and ONLY the seam allowances are pressed towards the interfacing. This is done to just quickly and temporarily "tack down" the interfacing to the SEAM ALLOWANCES. Do NOT let your iron drift PAST the seam allowance! Pressing the FABRIC is fine...But at this point..DO NOT PRESS THE INTERFACING PAST THE SEAM ALLOWANCES. Next, the facing unit is turned over, and the interfacing is wrapped around (over) the pressed-together seam allowances to the wrong side of the facing piece. At this point the interfacing is ready to be fully fused to the wrong side of the facing piece...so finish fusing the interfacing to the wrong side of the fabric facing pieces (NOTE--the interfacing will NOT meet the straight and other edges of the facing...because those are the edges that will be sewn to the shirt-fronts..and extra bulk is not needed or wanted in those seams). This is what the finished "Wrapped-edge Facing"
<----And this is what it looks like from the WRONG side. And when the Wrapped-Edge Facing is sewn into place to the Center Front seam allowance of the Shirt Front pieces....the loose edge of the facing inside of the shirt looks fantastic! I recently used this technique on the neck facings on some pullover tops. It looks so much better on the inside, no exposed seams. Thanks for posting the tutorial. Thank you so much for the tutorial. What a lovely edge that produces. That is a lively finish, Pam. I ike it. Thanks for sharing! Thank you for being so generous and sharing your knowledge. When you posted this the first time I tried it with a sewn in and it works just as well. Great pictures and I love Roger's new shirt. Bought the pattern today at JoAnn's! Hi Theresa...yes it will work with a sew-in interfacing. However, I suggest that you "stitch-in-the-ditch" of the interfacing seam after it is turned to the wrong side....to hold the wrapped edge in place while the rest of the shirt is being constructed. And then tack the rest of the interfacing to the facing so it doesn't shift by basting or tacking it down all over the wrong side with a glue stick. Thank you for the tutorial!!! Thanks, Pam. I have a shirt in the works for my husband and will try this technique-using your fabulous interfacing, natch! I've been using this technique off and on since you posted it awhile back. It works GREAT! Thanks for the reminder. I love using this technique, it gives you such nice looking facings! Hello there! 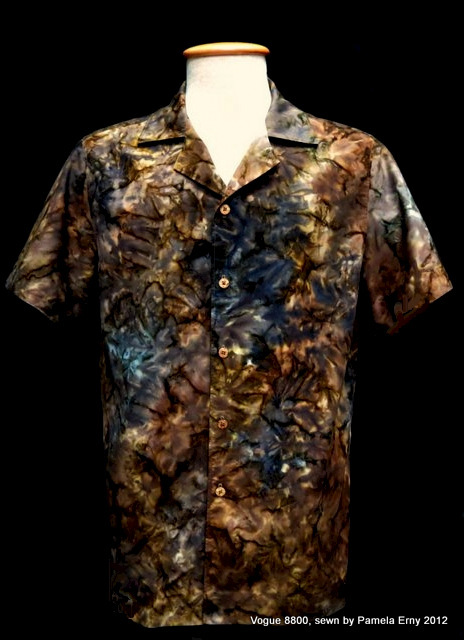 I have been making my son shirts out of cotton fabrics that have about a medium weight. 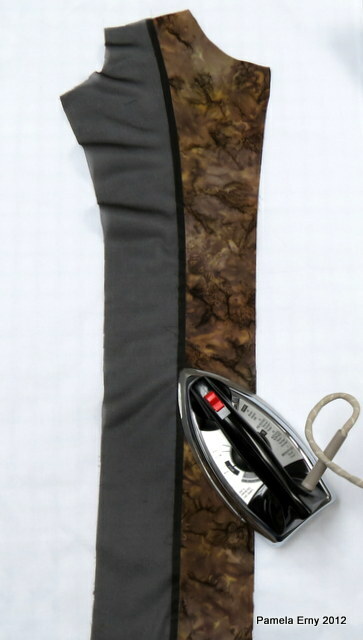 Would this type of interfacing work since the fabric is a little heavier than what is recommended? I have never been very pleased with the inside of his shirts. I am really anxious to try this method! It would really bring my sewing up a notch. 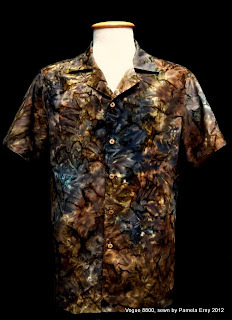 Hi Shirley Ann, Yes...if you are using a heavy shirt fabric, you can use a lighter interfacing and get good results. However, you may want to interface both upper *and* under collars, stands, and cuffs. Thank you so much! This will make my son's shirts look so much nicer. He is preteen, loves for me to make his clothes, but now that he is older, I feel I need to focus even more on the details. Thank you so much for providing such detailed tutorials on your blog! You are teaching us a lot. I follow you from Europe, Spain, and I´m happy with all your tutos. You spend a lot of time making them and we really appreciate them. I read all of them once each time I can to remember your teachings. I love all of them. You are a great Professor. The only thing I don´t like very much is that I have to write as annonimus because i have not an open ID or a URL. I don,t know what they are. I am not a good user of all those things :( All the same, my name is Teresa and I´m a follower and admirer too !!!! I get it! It is like putting a binding on a quilt...sort of. Thanks! Thanks so much for sharing your knowledge. We all become more proficient sewers with your help. Great new shirt for Roger's collection. Thankyou so much for this tutorial Pam.